Unicorn At The Fountain IV tapestry shows the unicorn cleansing the water, based on the Hunt of the Unicorn series from the 16th century. Here in this piece, the fountain at the unicorn tapestry we see the unicorn's cleansing horn purifying the water as forest animals watch, as does the hunters. This work is based on the originals created between 1495 and 1505, the second of the seven of which shows this scene where hunters are gathering around the unicorn. The originals were thought to be commissioned by Anne of Brittany for her wedding. 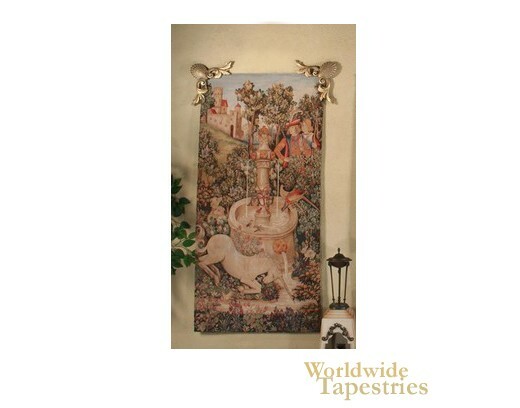 This unicorn tapestry Unicorn At The Fountain IV is backed with a lining and has a tunnel for easy hanging. Note: tapestry rod and accessories, where pictured, are not included in the price. Dimensions: W 27" x H 57"